You’ve heard the plaintive meow of a cat and the guttural growl of a lion. Ever wonder why those two felines sound so different? Bioacoustics is the study of the relationship between living things and sound. This includes animal sound production, transmission, and reception. Animal sounds are recorded in the field or in the laboratory with microphones (in air) and hydrophones (in water). These devices pick up sound vibrations and convert them to electrical signals. These electrical signals are recorded, then analyzed using computer software. 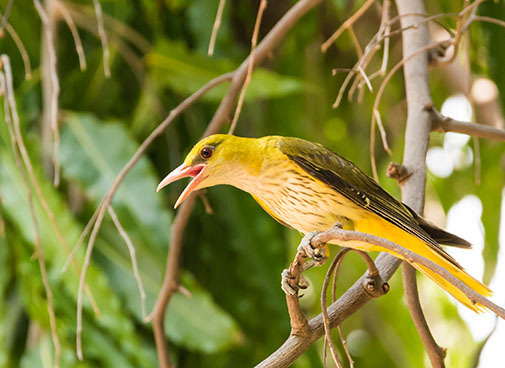 By studying animal sounds as they relate to animal behavior, anatomy, and physiology, scientists can use acoustics to answer broader questions about animal ecology and evolution. 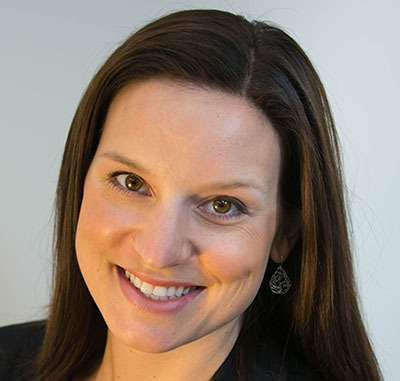 Professor Laura Kloepper in the field. Photo courtesy of Marcia Kloepper. 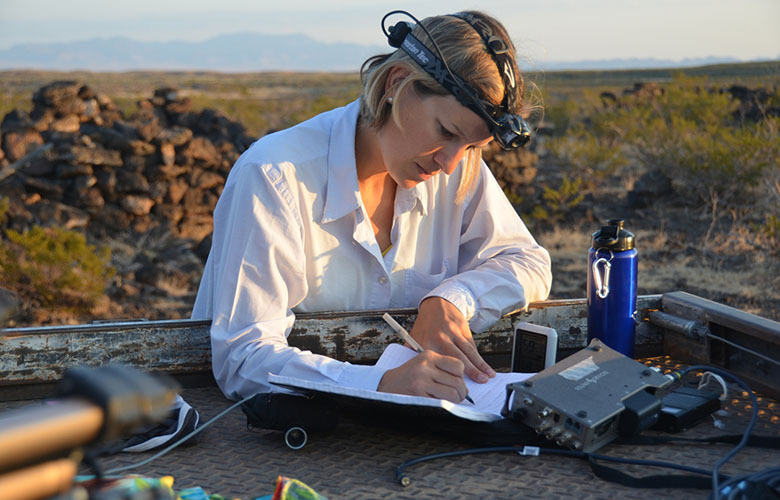 A great example of a bioacoustics study is to analyze the relationship between the size of organisms and the acoustics, or sounds, that they make. As you can see in the graph below, body size in the animal kingdom is typically inversely proportional to the frequency—what we hear as pitch—of animals’ calls. That means that bigger animals generally produce lower-frequency sounds than smaller animals do. 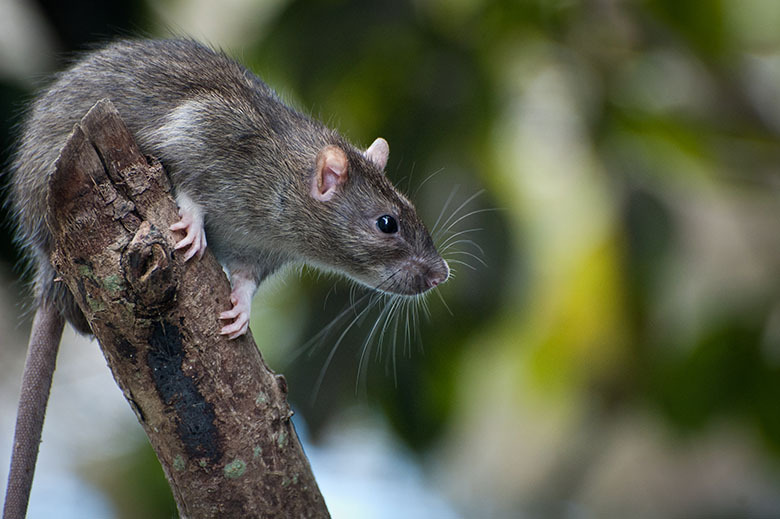 Let’s think about two animals with dramatically different body sizes: the moose and the rat. 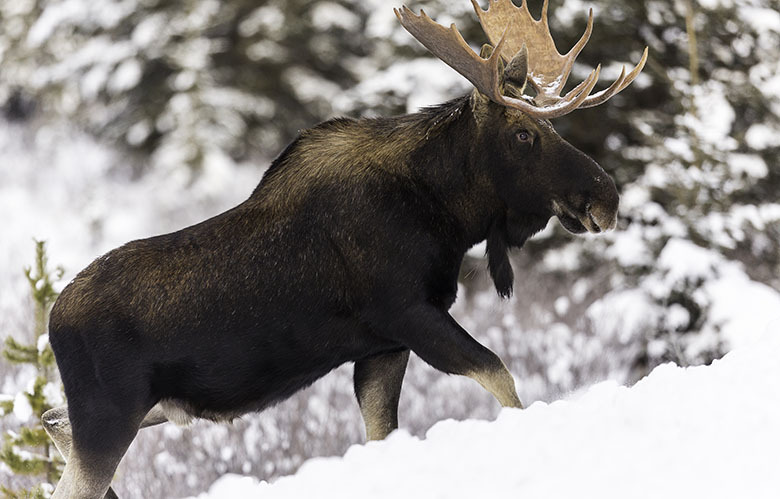 An average bull moose (Alces americanus) has a mass of 541 kilograms, in contrast to the 0.5 kilograms of an average brown rat (Rattus norvegicus). Based on size, which animal would you expect to make a low-pitched sound? Based on the sounds, which animal produces sound at a higher frequency, or pitch? Some species also demonstrate sexual dimorphism in their acoustic signals, meaning males produce different acoustic signals than females. This effect is something we clearly hear in humans: many adult males have lower-pitched voices than adult females. 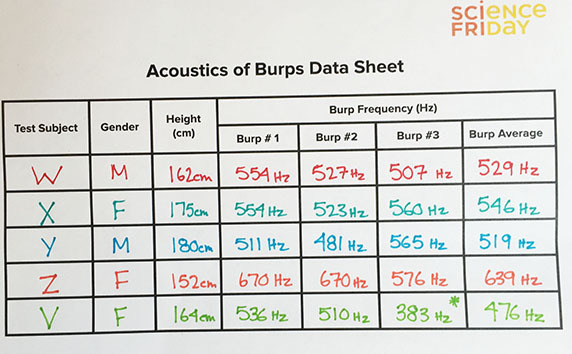 In this activity, you will investigate how height and gender affect the acoustic signals of some of the most unusual sounds a human can make—burps! 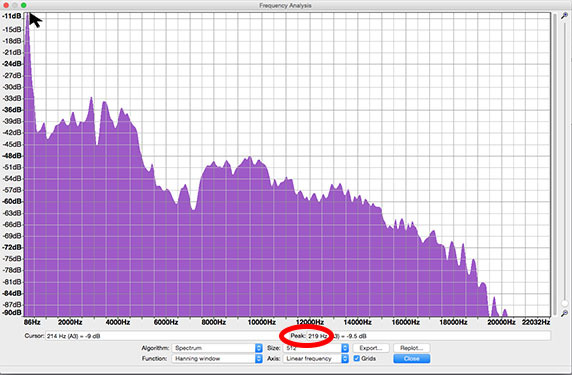 More information on operating requirements for Audacity here. 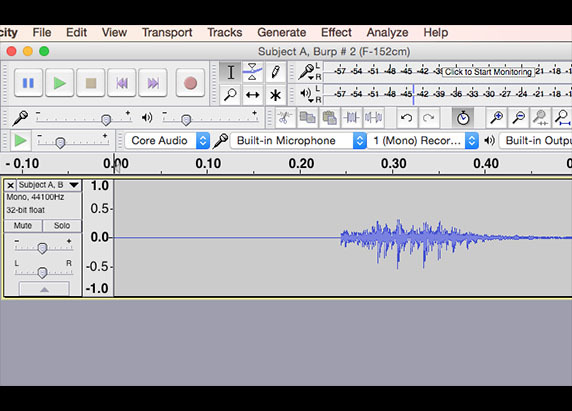 Verify that you can record and play back a sound in Audacity. 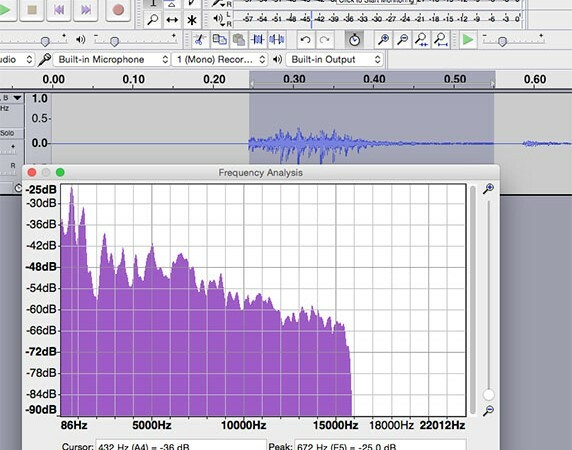 Open Audacity, click on the red circle to record, and speak into the microphone on your computer. As you speak, you should see the graph update with the intensity of your sound over time. This is called a waveform. Click on the yellow square to stop the recording. 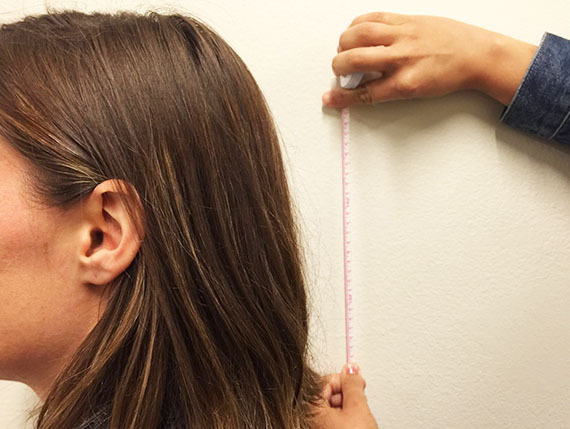 Verify that you can properly measure the frequency content of your speaking voice. 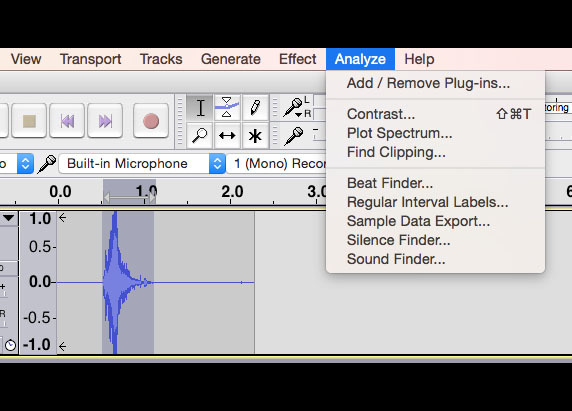 Highlight one part of your waveform, and then select Analyze—Plot Spectrum from the upper menu on the screen. 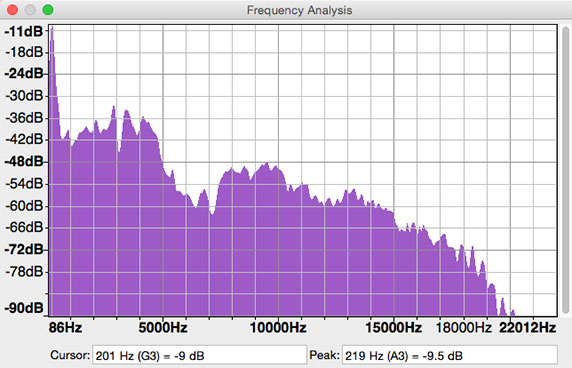 You should see a window titled “Frequency Analysis.” This figure shows the frequency component of your signal. The x-axis indicates the frequency (in Hertz, or Hz), and the y-axis depicts the intensity (in decibels, or dB) of your signal. Hover the cursor over the highest point on your graph, and then look at the box at the bottom right, labeled “Peak.” The value in Hz represents the peak frequency of your signal. Now—time for burps! 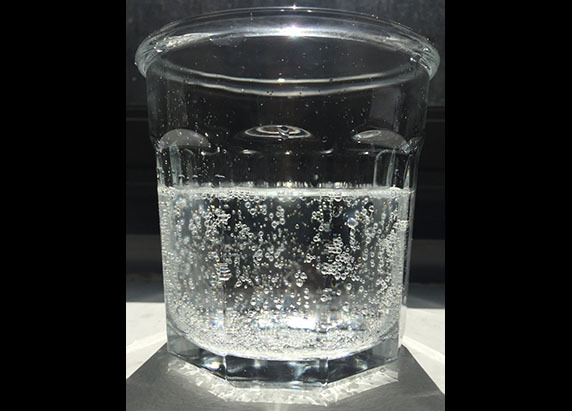 Drink some carbonated water until you feel the urge to burp. Do not force yourself to burp. 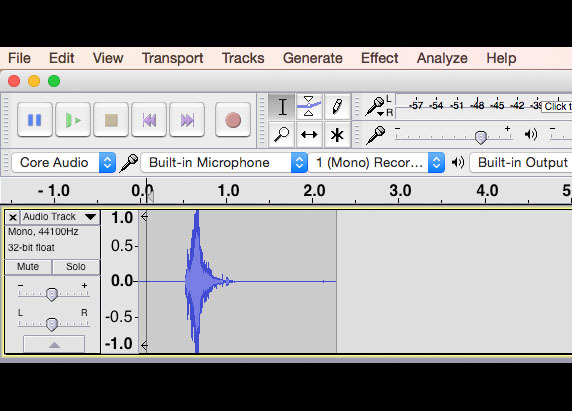 When it is time to burp, record your burp in Audacity. Try to record in a quiet environment, as other sounds may interfere with your data. Select the entire duration of your burp, and then determine its peak frequency in Audacity. Round to the nearest whole number. Repeat your burp and measurement two more times, and then determine the average peak frequency of your burp. Round to the nearest whole number. With the help of a partner, determine your height (cm). Collect data on gender, height, and average burp peak frequency for at least four other people by repeating steps 4-8. Create a new graph to represent your group’s collective data. Plot average height (x) and peak burp frequency (y) for each individual tested. 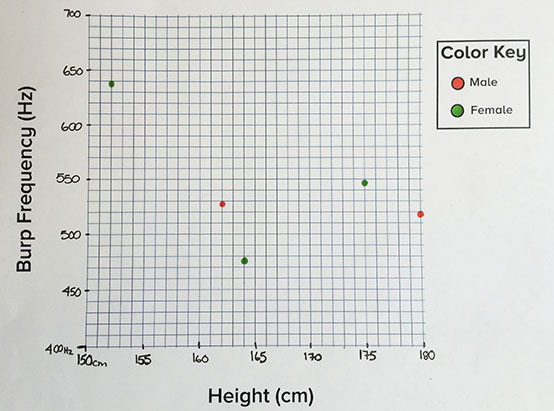 Use different colors to represent data points for different genders. 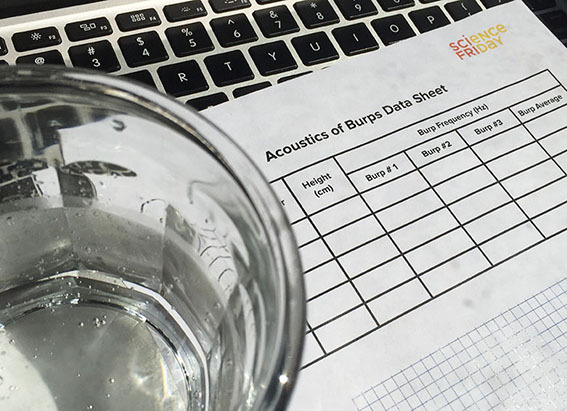 Here are some burps from Science Friday, if you need more data! Do you notice any trends related to height and burp peak frequency? What about gender and burp peak frequency? Describe if and how the peak frequency of burps changed depending on height or gender. Why do you think the frequency did or didn’t change? Think back to the moose and the mouse. Do your results support the concept that body size, in this case height, is inversely proportional to the sound frequency (Hz) found in the animal kingdom? What other factors do you think might change the peak frequency of a burp? Say you wanted to burp with a higher pitch. What would you change about your burping style? Why? Design your own investigation to explore how body size, age, and/or gender relates to human sounds. What other factors could you investigate that may affect the frequency of human sounds? 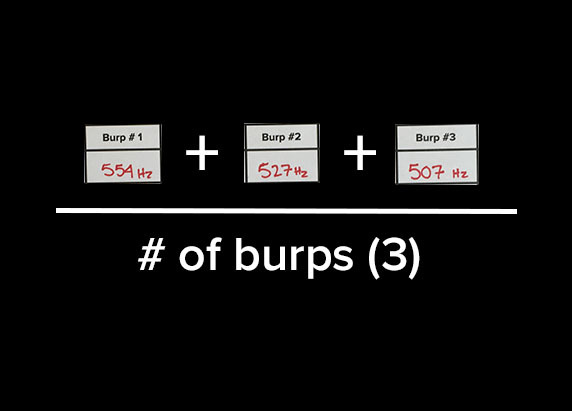 Besides burps, can you think of another sound that humans make that you could study for the sake of comparison? After you have designed your study, collect your data, graph them, and reflect on whether your results support your predictions. Further explore the acoustics of human speech with the activity “Exploring Human Speech”. Explore age related differences in sound with other animals, bears! Explore how bioacoustics are used to understand the echolocation of dolphins or the echolocation of bats.